Winter boots are a must-have for college kids who attend school in cold and snowy climates. We recently asked our Grown and Flown Parents FB group members to tell us which brands their teens love to wear. We’ve listed the favorites along with boots that our fashion-forward young adults told us were very much on trend THIS SEASON. No great surprises that the girls’ lists were much, much longer than the guys, many of whom prefer to stick with their sneakers year round, regardless of how many snow piles they have to jump across to get back to their dorms. We receive a small amount of compensation from purchases made through some of the links in this post. Thanks! The L.L. Bean Duck Boot is a classic, equally popular with guys and girls for winter boots. They are sold in all different heights and some are lined, giving them additional warmth. These boots last a lifetime. Frye, which began in Massachusetts in 1863, makes the iconic boots that my college daughter loves to wear with dresses and skirts. They are sturdy, fashionable and, with their rugged style, getting them scuffed at a football game or party only adds to the patina. 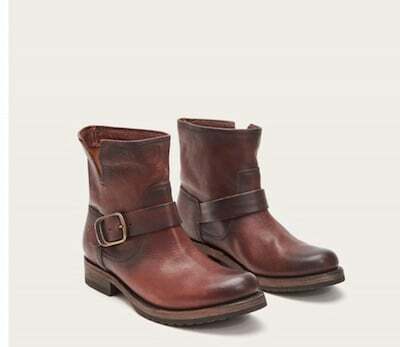 Frye has booties and high boots, western and uber-urban styles for both girls and guys. Through November 27, get a $100 for every $400 you spend. Students can get a 20% discount on purchases so consider a gift card for the holidays. 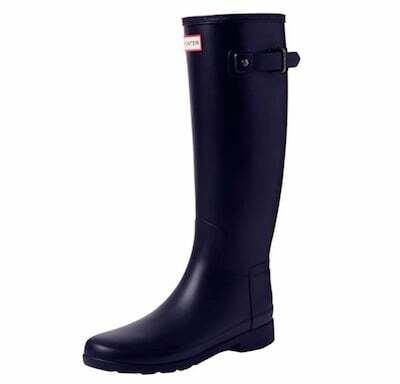 Hunter boots are exceptionally sturdy and will keep your daughter’s feet dry when it’s rainy or snowy. These popular boots come in loads of colors and heights. 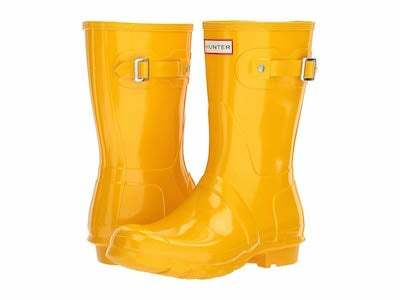 Why not go for these short yellow ones just for fun or the tall navy ones that are classic and surprisingly stylish for rubber boots. Wear them with a heavy Hunter boot sock for extra warmth. This leather boot is just the right amount of rugged with a low bootie cut. The leather is waterproof which is super-important for rainy/snowy conditions. From the makers of the iconic top-sider shoe, comes the top-sider boot. This navy and tan pair are a classic look. We like this slip-on suede bootie in the neutral taupe color, a versatile alternative to black. Timberland make great durable boots and this one is surprisingly fashionable. This boot will keep your daughter’s feet warm and dry all winter long. We love the faux-fur lining and the quilted, waterproof exterior. Dr. Marten’s are unlike any other boot – timeless style and iconic. These are higher boots and the straps give them a fashion-forward look – not that easy to pull off for a snow boot. Target has lots of winter boots out this year in all the popular styles your daughter loves and at some fantastic pricing, too. Here are four of our favorite boots for teens from one of our favorite stores. Western boots are all the rage and these by British store Top Shop are very trendy. Nordstroms has always had an amazing shoe and boot selection with lots of sizes for harder-to-fit feet. They carry many of the brands in this post and their website is a great place to look at dozens of different styles – booties, boots, fashion and winter boots, too. This boot can take you anywhere, day or night. These are gorgeous – not practical AT ALL in the rain or snow but so elegant when weather is not a factor. For your fashion-forward daughter, this bootie is super-expensive but has a feature that is very in right now. Luckily it is on sale but definitely a splurge item. This Timberland camel-colored suede boot is one of the most popular boots for young men – it never goes out of style and it’s truly one of our favorite boots for teens. We think the Sorel brand is a good one to consider for a leather boot. Sperry makes a popular duck boot with rubber bottoms and leather uppers. Another brand to consider if your son likes more of a work-boot look. If your son wants a hiking style boot, Merrell makes some very durable boots that work well for longer-distance walking. This is a good boot is your son is planning to do any hiking.